Earth Mantra is very happy to welcome another new artist to our roster, this time a man named Christian Doil from Leipzig, Germany who releases experimental ambient and drone music of the highest order. With his new album Metall, Christian has created a work of sound sculpture and atonal ambience that we feel is certain to turn some heads. What is most remarkable about this approach is the musicality of the results. In the hands of another artist, such a concept as an album of metal might result in a collection of screeching, scraping, or otherwise impenetrably challenging sounds that are difficult to listen to. Not so with Metall. The music is atonal, make no mistake, with only the barest emergence of discernible tonality anywhere in the album; but despite its abstract nature, the end result is extraordinarily smooth and impressively musical. What really grabs our attention is the composition. With pieces like Chrom, Gold, and Silber, we are struck by how completely tangible and approachable the structure is, with recognizable verses, choruses, and other traditional structural elements. And yet the music is completely abstract, with nary a traditional note to be found. Folks, it is one thing for an artist to dedicate themselves to the study of abstract sound. It is another for them to translate that study into sounds that are immediately graspable by the listener. But it is nearly unheard-of for them to marry that world of abstract sound design with the world of traditional musical composition, in such a seamless, transparent, and effortless manner. An amazing achievement. 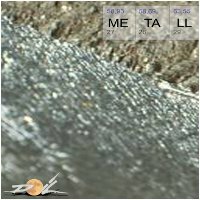 We are very happy to be releasing Metall to our audience, and we invite listeners who maybe aren't so keen on the idea of abstract atonal music to give this album a try. Lovers of experimental music will without doubt enjoy what they hear, but we think even folks who normally eschew such abstraction will find something to love in this release. Truly, this is one of the best pure atonal ambient albums we have heard in quite some time. Highly, highly recommended. "each metal has a unique frequency and how it affects us?" -- from Christian's website.. the song 'bronze' just revealed a 'glovving vvindovv'.. haven't listened to the recording in it's entirety before, but eye vvill after DL.. just wanted to log the alchemical experience that 'bronze' evoked. Highly original stuff. At times it is dark ambient with industrial touches, like a soundtrack to a sci-fi horror flick. Other times experimental with a strong sense of non-human-ness. Definetely one of my favorite experimental dark ambient albums!